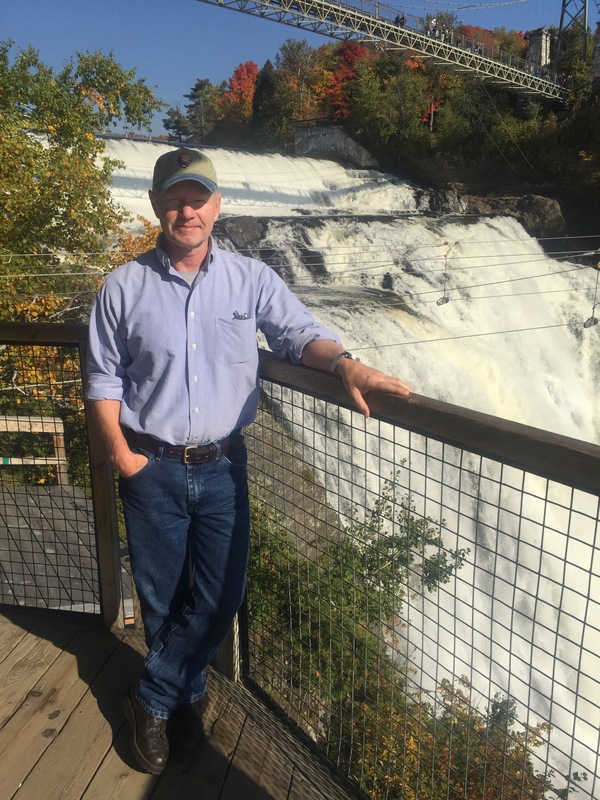 Vermont Days off – the finale! Though we’d paced ourselves pretty well – readers of parts 1, 2, and 3 of this series can attest – there were some pretty major to do’s to check off in this, our final month in Vermont. First, a visit to Canada. Specifically, Quebec which, with its French language and culture, would give us more of that “we really are in a foreign country” feel. 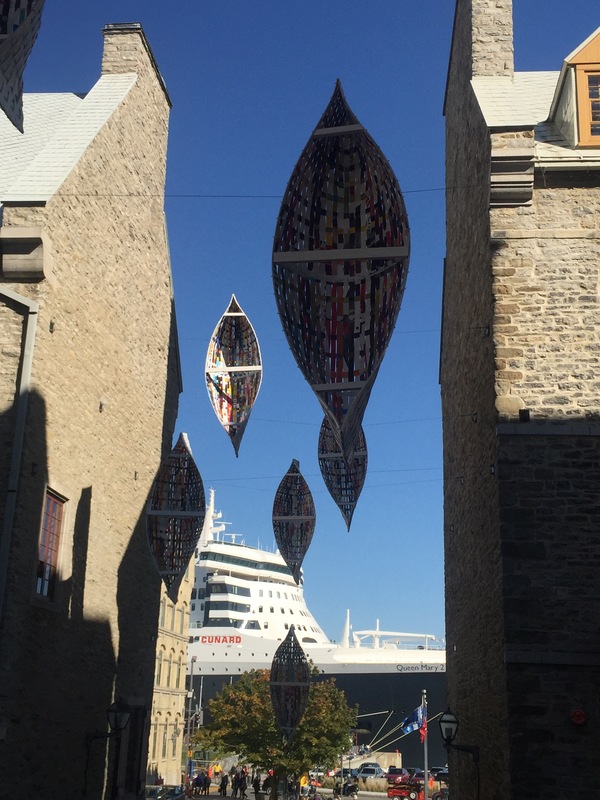 We chose Quebec City over Montreal because friends recommended it as smaller and more approachable for a short visit. 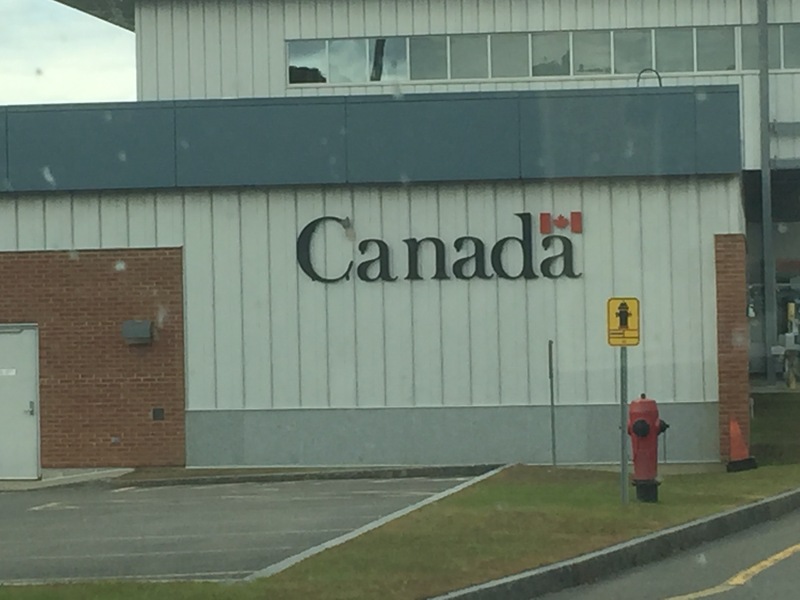 When we reached the border, we were greeted not by a wall, but by a really utilitarian looking building with the country’s iconic maple leaf. 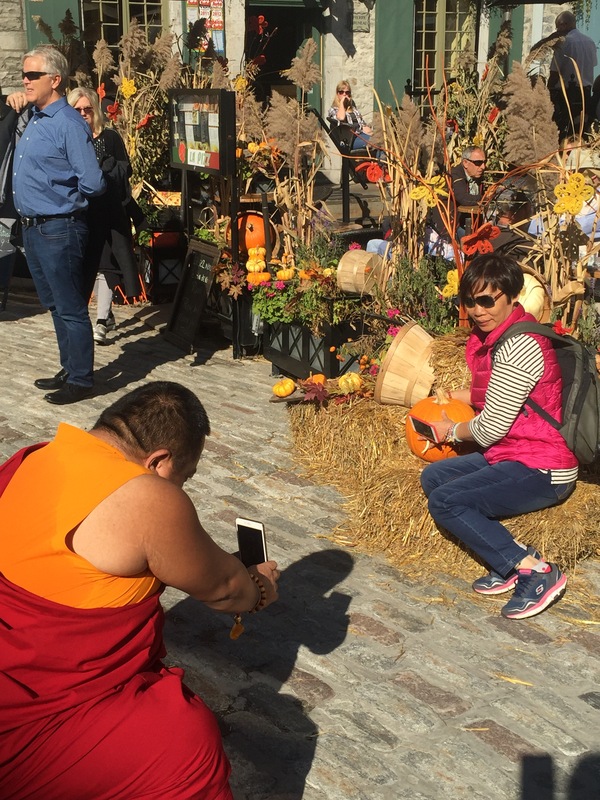 A few other choice pictures are below, and you can read my blog post for a full report on our visit to Quebec City. Ben’s family came for a visit around Columbus Day – now officially designated Indigenous People’s Day in Vermont. First his mom arrived – she is insatiably curious about everything. 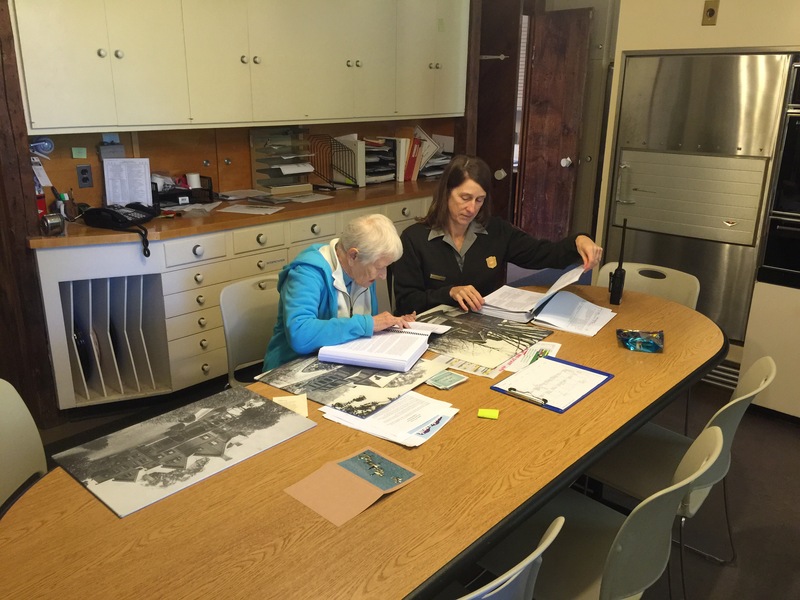 Here we are in the Marsh Billings Rockefeller mansion kitchen, and the parking lot, immersing ourselves in all there is to know about the Park. The next day, Ben’s sister arrived with two of her sons, our nephews. The five of them toured around while I worked. 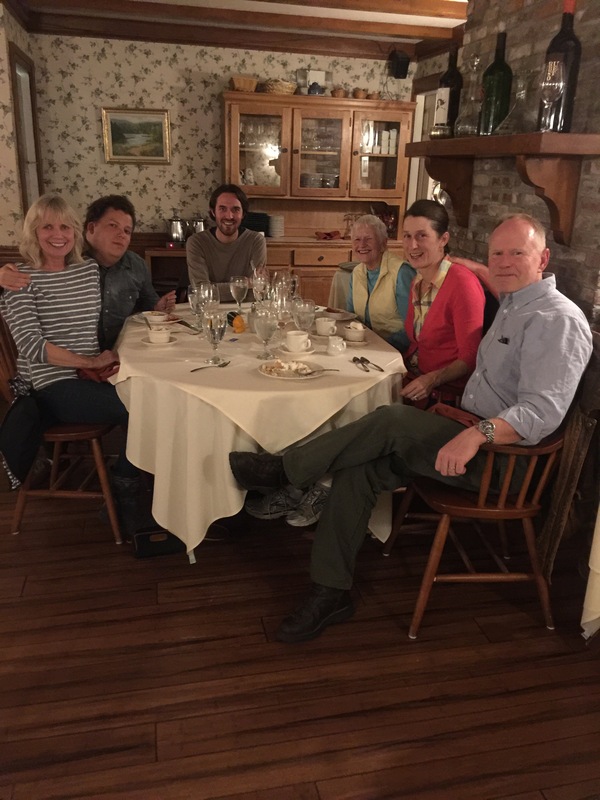 We had a lovely dinner out the last night at the Queechee Inn at Marshland Farm, which has a great Wednesday night pre fix dinner special. 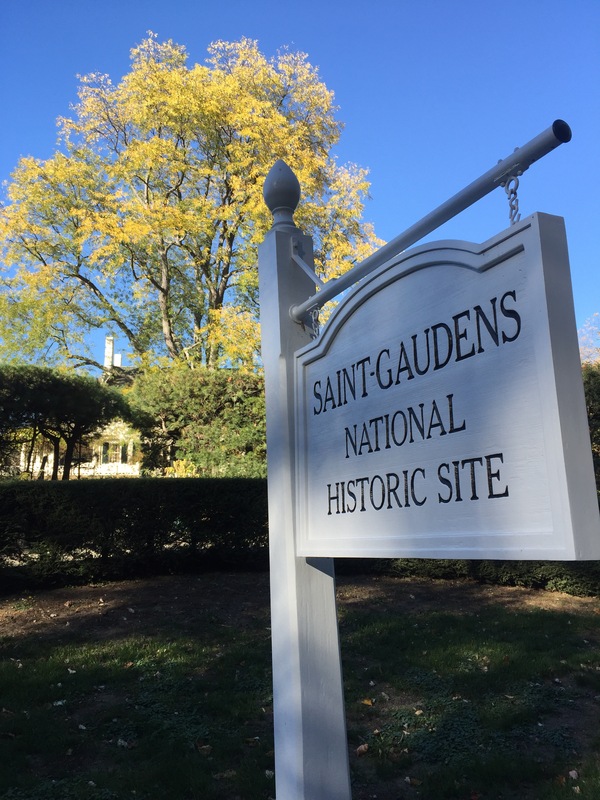 Just across the Connecticut River lies our sister park, Saint-Gaudens, which celebrates the Cornish (NH) Colony of artists and, in particular, the sculptor Augustus Saint-Gaudens. 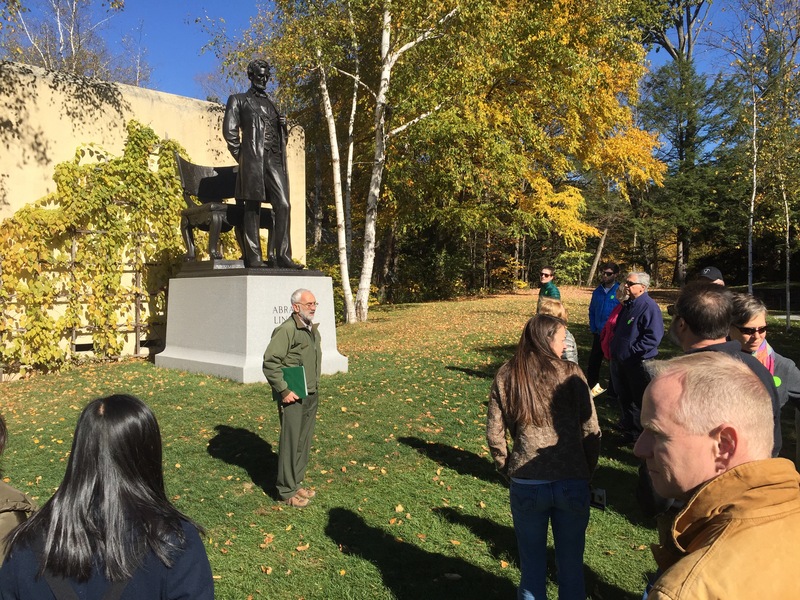 The park, as is fitting to celebrate a sculptor, is filled with re-castings of his works, including many massive, well-known pieces celebrating people in American history. Simply breathtaking – you don’t have to go to Boston, DC, or Chicago to see the original castings of the 54th Regiment, Clover Adams, or Lincoln. The grounds are open year round. Col. Shaw was the young commander of the 54th Colored Regiment. He is buried alongside his men who died in battle in South Carolina. His parents, ardent abolitionists, commissioned this work and insisted that his soldiers be included in the memorial. Their story is the focus of the movie, “Glory”. “Clover” Adams, the wife of Henry Adams, committed suicide. 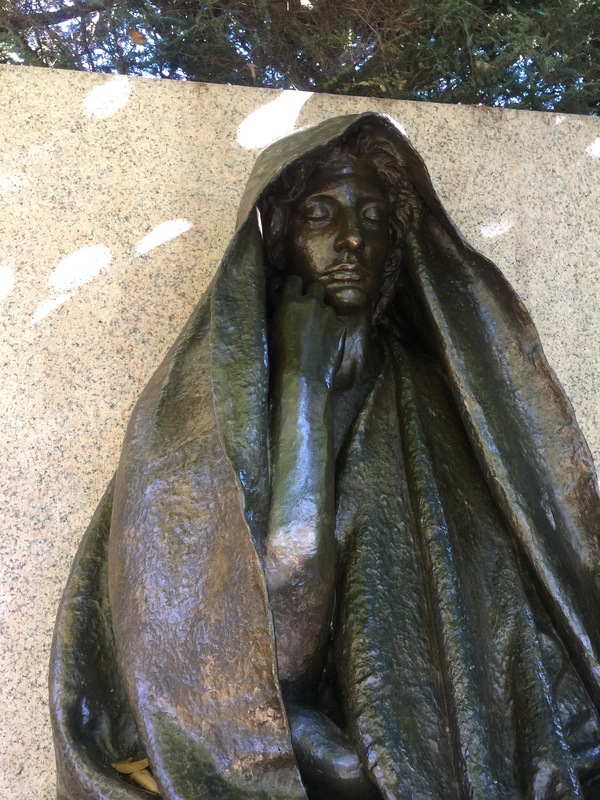 The original of this sculpture is beside her tomb in Rock Creek Cemetery, DC. It is not meant to depict her, but rather to be evocative of the peace that can follow grief. Original casting of “Standing Lincoln” is in Lincoln Park, Chicago. Saint-Gaudens worked from life masks and his memories of seeing Lincoln. 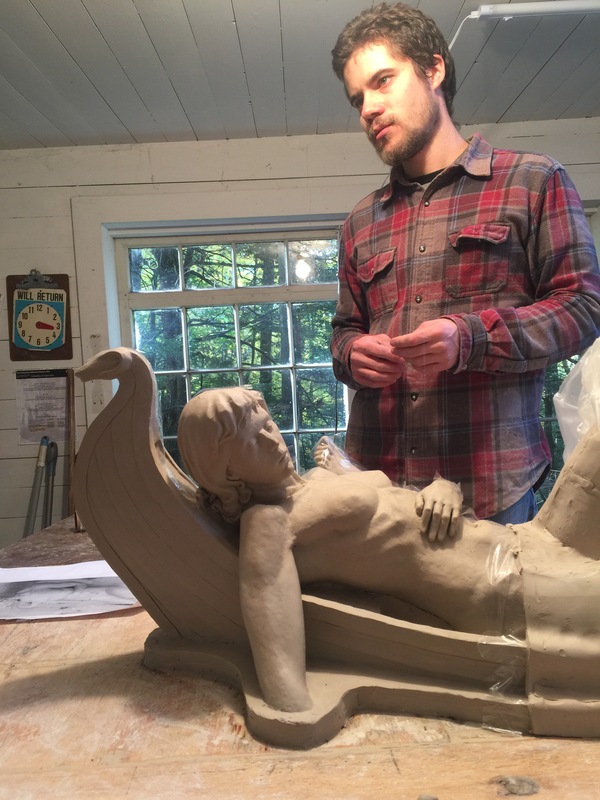 The sculptor in residence talks to visitors and works in his cozy studio on the Park grounds. 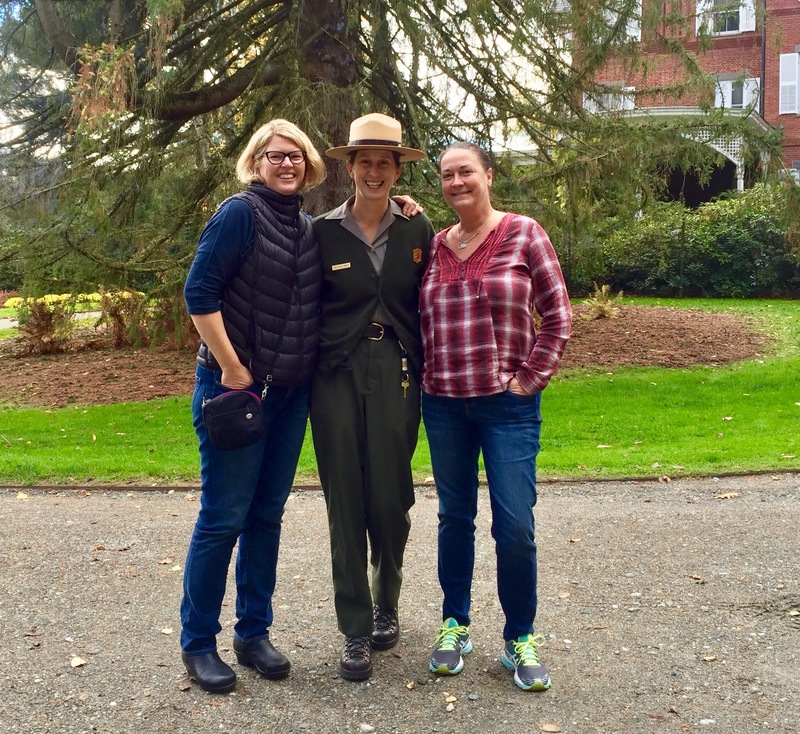 Our last visitors -two of my best friends, Laura and Amy – visited from DC and Boston respectively. Some fun in the mansion and on the farm. It was the worst weather – rain – of the whole season, but there was plenty to do nonetheless, including a trip to King Arthur Flour for them. 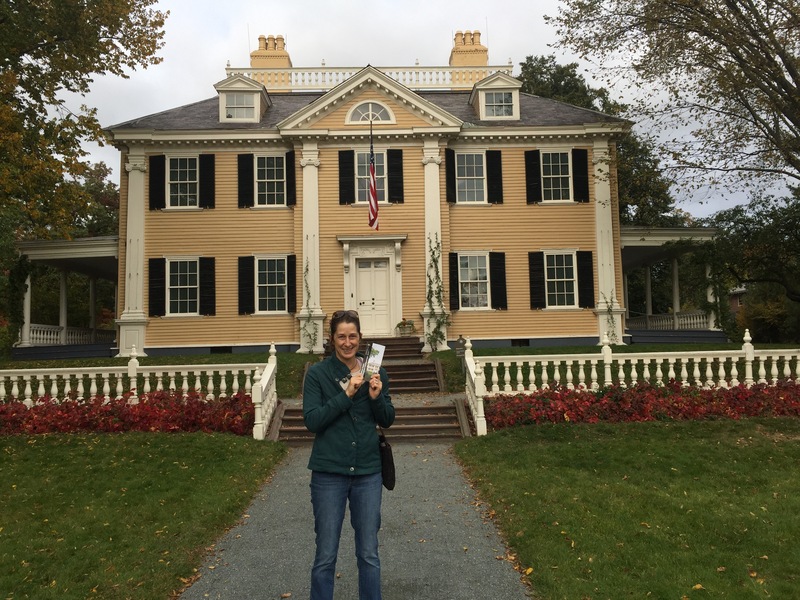 Laura and I went to Boston – and she uncomplainingly indulged my interests, visiting the original Saint-Gaudens Shaw Memorial (in Boston, where Shaw was from, on Boston Common directly across from the State House), as well as the Henry Longfellow House in Cambridge (below), an NPS site that was also Washington’s headquarters early in the Revolution. Our tour guide was fantastic – at the end I asked her if Longfellow had any enemies/rivals. She quickly replied, “Oh yes – Poe thought he was a joke!” Ha! Our park has a painting depicting a scene from a Longfellow poem about Miles Standish, so that got me particularly interested in visiting this site. Finally, on a last afternoon, we went to the Rokeby Museum in Ferrisburgh, VT. 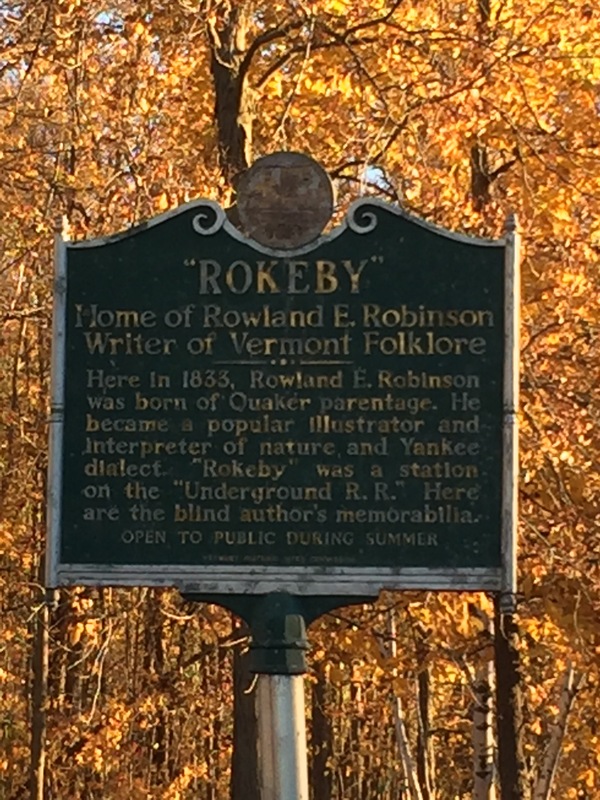 The Rokeby is dedicated to telling the story of the Underground Railroad in Vermont; the farm buildings were used to hide those heading to Canada to escape slavery. But we also caught a lecture on the Abenaki, the Native American tribe in this part of New England. 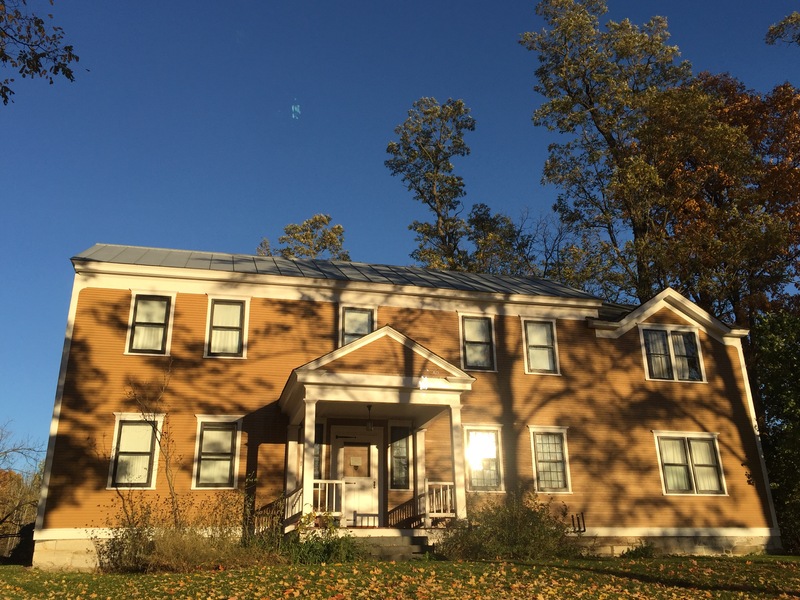 There are many Abenaki-related items in the Rokeby collections, and the speaker argued that as important as it is to interpret African American history, the site had an obligation to do the same for Native American history. After all, he said, there was a genocide taking place right here, perpetuated by the same people fighting for the freedom of black Americans. 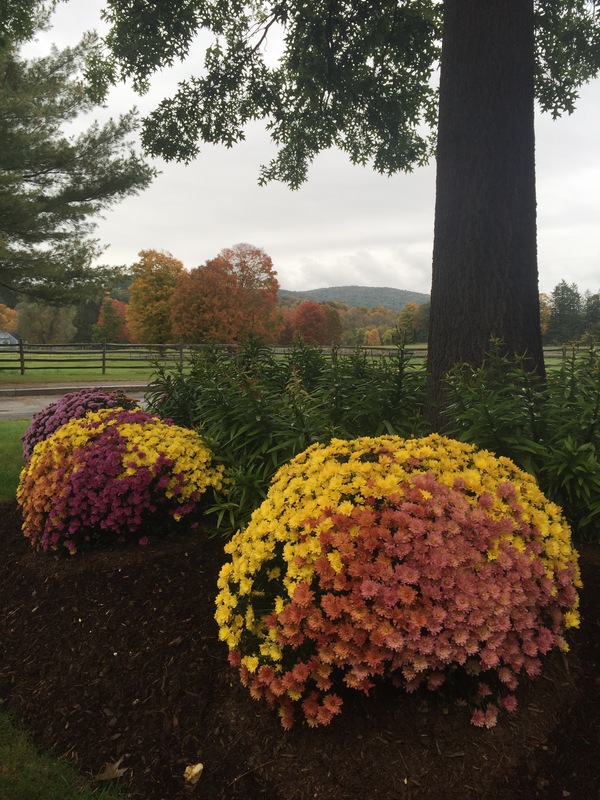 And I will leave you with one final shot of fall foliage from Billings Farm, adjacent to our Park, whose fall decor game is on point: note the arrangements of mums in colors to highlight the foliage in the background. 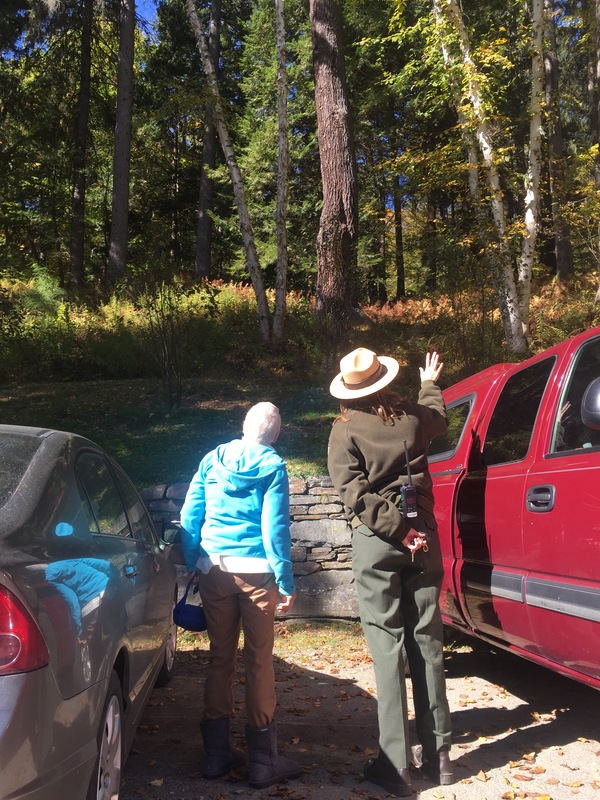 ← More Vermont Itineraries – Penultimate Post!